This vegetable spiralizer turns a butternut squash into vibrant, paleo-friendly pasta in just seconds. In addition to the stunning color, butternut squash noodles offer a sturdier alternative to the ubiquitous zucchini noodles. The starchier, sweeter texture holds up to heavier pasta sauces, but works just as well with this light cream sauce. This is one of the few recipes on Empowered Sustenance which demands dairy. I began this blog four years ago, when I had just started a strict elimination diet and healing protocol called GAPS. Now, years later, I’ve been able to introduce many foods which I once couldn’t enjoy without symptoms. This includes goat cheese, as well as nuts and seeds. Interestingly, it was when I had peacefully and contentedly settled into my dietary restrictions that my body tolerated food re-introductions. If you do not consume goat cheese, feel free to leave it out and toss the noodles with a dollop of coconut cream, coconut butter, or ghee. It won’t have the same creamy texture, but it will be delicious all the same. 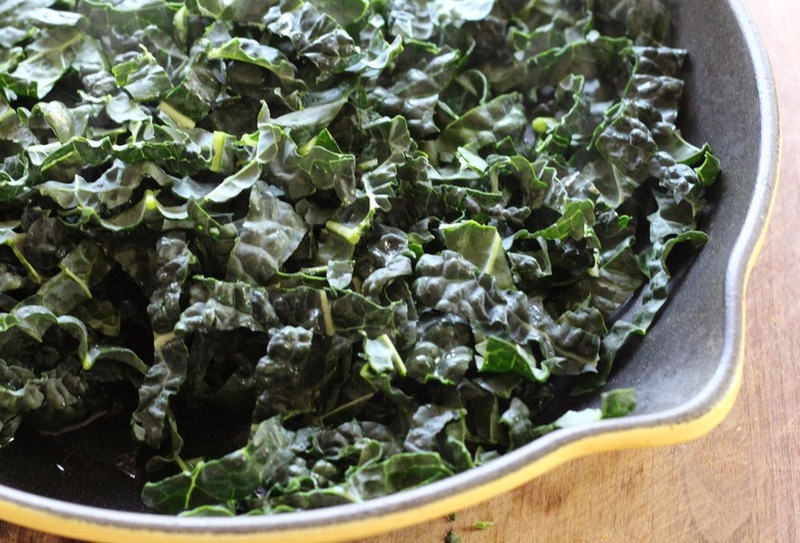 Kale adds color and a lovely heartiness to compliment the bold smoked paprika. Fresh thyme takes the ingredient count over five, but is well worth it! It brightens up the plate and emphasizes the rich goat cheese. With just a handful of ingredients, this grain-free pasta dish brings balances rich and creamy chevré with hearty kale and earthy smoked paprika. Preferably, choose a squash with a large stem end as this is the part you will spiralize. The cavity with the seeds can not be made into noodles. Set that aside for another use. 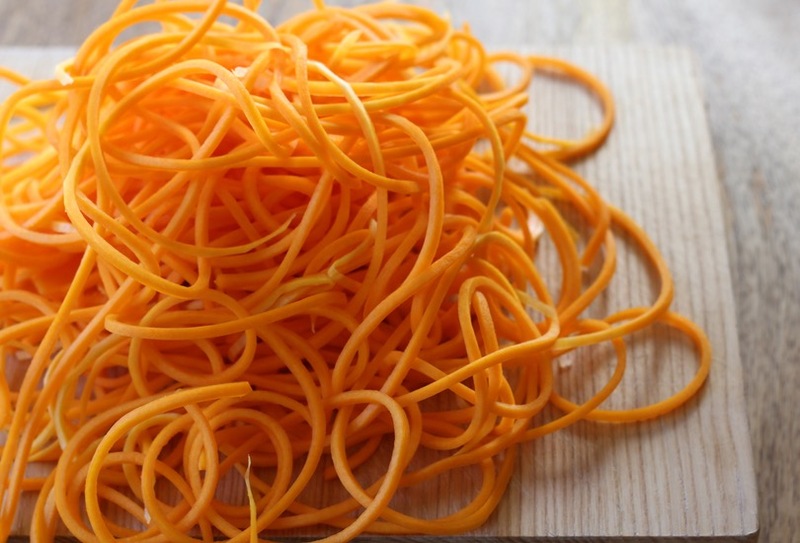 Peel the squash and spiralize it into noodles. Prepare the kale: remove the stem and then chop it finely. Saute it for 6-8 minutes, stirring occasionally, in the ghee or coconut oil. Meanwhile, bring a pot of water to a boil. Once boiling, add the butternut noodles. Cook for about 3 minutes, until tender but still firm. Drain. Mix the chevre into the kale and stir to create a creamy sauce. Add in the butternut noodles with salt and pepper to taste. Stir gently, to coat. Divide between plates and dust lightly with smoked paprika. Add a pinch of fresh thyme to finish. If you do not want to use the goat cheese in this recipe, you can substitute a tablespoon of coconut oil or ghee for richness. However, the sauce will not have the same creamy texture. Alternatively, use ¼ cup of coconut cream (the thick cream that settles to the top of a can of full-fat coconut milk). This will add richness, but will not cling to the noodles the same way chevré does. 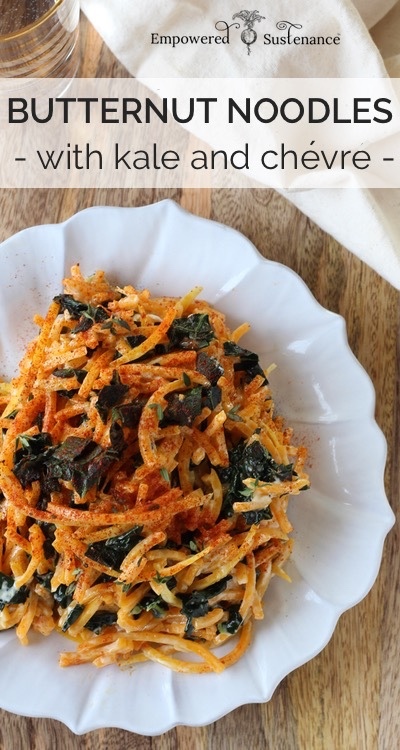 Thanks for this wonderful recipe ides, I just got my spiralizer and have been eating noddles for three days straight! Just as a side note though, I thought I should tell you that the word you want to use is spelt “chèvre”, unless there is another spelling in English that I’m not aware of. I’m French and that’s how we spell it! I want to take this opportunity to thank you for your blog and your recipes and tips. I’ve been trying to eat a carrot a day among other things and it’s really helpful. My daughter ate your sweet crepe recipe for months and the gelatin really helped her gut heal from previous gluten intolerance. I understand that you will start your practice soon and I’m sure you will help so many people on their health journey, I wish you all the best in that new adventure! You would have the correct spelling for it, thank you and I’ll go correct the title. I’m so glad to hear that my recipes have been helpful to you and your daughter! Looks so good and comforting! I have a buttternut squash sitting on the counter that I need to do something with and this is perfect! Thanks!